Canvas @ YaleInstructor Guides Canvas @ Yale InformationHow do I post my Syllabus in Canvas? Please watch the video or the read the steps below to learn how to upload your syllabus. When you post your syllabus and publish your course in Canvas, your syllabus will become available in the Yale's Course Search. It may take up to 6 hours for your syllabus to appear in Course Search. The syllabus description is where you can post your course description, a brief introduction, class guidelines, weekly reminders, and other important information. NOTE: When you post your syllabus and publish your course in Canvas, your syllabus will become available in the Yale's Course Search. It may take up to 6 hours for your syllabus to appear in Course Search. You can copy content from Word documents directly into the Rich Content Editor or create original content inside of the Rich Content Editor. 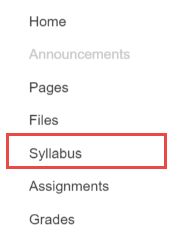 When you are finished updating the syllabus, click the "Update Syllabus" button to save your changes. 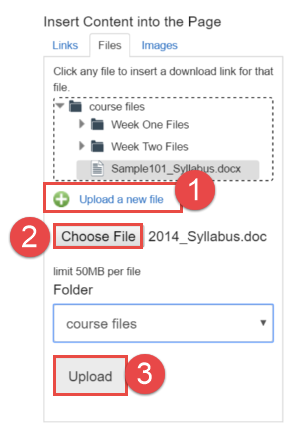 You can also link to your preexisting Syllabus document by uploading it into Course Files as a PDF and linking it in the content selector. 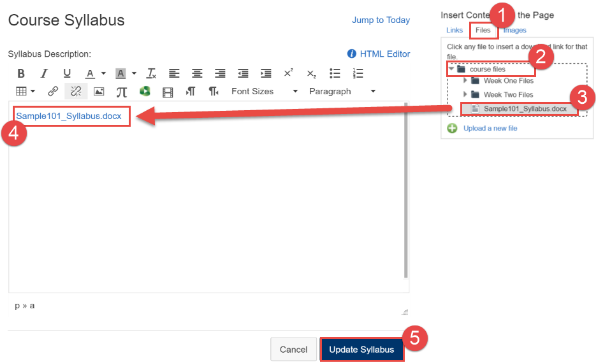 Canvas will automatically create a preview of your document so your students don't have to download it before reading it. Click on "course files" to expand the folder. A link to your file will now appear in the editor. 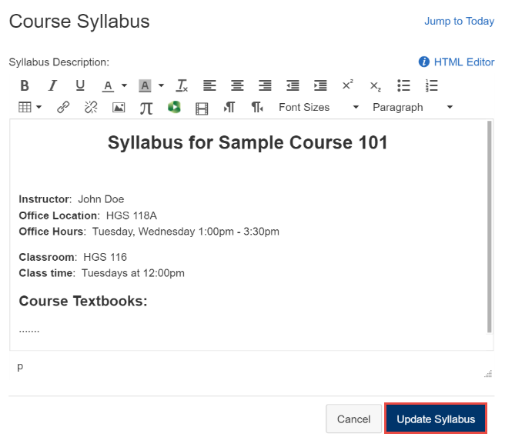 Click "Update Syllabus" to save your changes. In the content selector panel, click the "Upload a new file" link. Click the "Choose File" button and browse your computer and select your document. Once you have selected your file, click the "Upload" button. The link to the file you just uploaded will automatically appear in the editor. Here is a beginning of term checklist to help you get started. If you would like more hands-on assistance, please consider attending one of our Canvas @ Yale workshops. Niemi, N. (2015). Developing a Syllabus. Considering Teaching & Learning Series. Harnish, R. & Bridges, K.R (2011). "Effect of syllabus tone: students' perceptions of instructor and course." Social Psychology of Education, DOI 10.1007/s11218-011-9152-4.